Podcasts — on-demand pre-recorded talks that can cover just about any topic — are an increasingly popular medium for consuming news, for on-the-go learning, and for entertainment. Today, more than half of all Americans report having listened to a podcast. With low production costs and the potential to earn both trust and admiration from new audiences, businesses have also jumped on the podcasting trend. Major brands like GE, Mastercard, eBay, Samsung, Verizon, American Airlines, Home Depot, and Caterpillar have all used podcasting to engage employees as well as people outside their companies, and to humanize their brands. And it’s not just for marketing. According to the Wall Street Journal, podcasting is quickly becoming the “new corporate memo.” More human and engaging than an email, a podcast enables corporate leaders to connect with employees and help them feel more invested in the company and in company initiatives. Leaders in learning and development are also leveraging educational podcasts to offer flexible and fun soft skills training on-demand as well as virtual brown bags. Interested in podcasting at your organization? Here’s what you need to know to create engaging, useful content. What’s The Secret To Branded Podcast Success? Building an engaged audience for branded podcasts is largely about consistency — consistency in the topics you cover, the frequency of new episodes, and your show’s format. While there isn’t one magic formula for successful podcasting, particularly for podcasts intended for internal employee consumption, there are some best practices. The topics you cover should align with your team’s goals. New episodes should be scheduled regularly, and frequency should be planned for right from the start based on how often your team will realistically be able to put out new content. And while you can dabble with different formats and content types, it’s best to have a standard format for most shows and to only deviate on occasion when the content demands it. Many companies have seen success with a two-pundit formula, in which podcasters engage in conversations and conduct interviews each episode. These are easy to execute without extensive planning, but be aware that this casual, talk-radio-style format will also need careful planning to ensure that the podcasters deliver your messages as you intend them to be heard. Other brands have been successful by tapping their best communicators with expert narrative skills, or by partnering with experienced podcasters who have had proven success at engaging and building audiences. This kind of storytelling is a natural way to share a message and especially excels at delivering big-picture visions and cultural ideas. Of course, to make the stories work, every episode requires planning, scripting, and practicing. Corporate educational podcasts are often created to support learning and development within the organization, enabling employees to learn by listening. These podcasts might feature one or more new lessons each week, or a structured sequence of episodes all building on the same subject over time. An audio-only podcast, however, may be of limited value when the subject covered would benefit from supporting visuals and other media to help explain key concepts. No matter the format, there’s one strategy that can have a big impact on engagement: include video in your podcasts, not just audio. Over 55 percent of communication is nonverbal. So whether your team is considering getting into podcasting or you’ve already been doing traditional podcasts for a while, video podcasting can make your messages even more engaging simply because, with video, you’re also sharing the eye contact, facial expressions, and body language of your presenters. Whether it’s through podcaster-led interviews or simply letting an employee tell their story, for many businesses, the goal of podcasting is to connect audiences with the human side of the company. What better way than video to connect the people in and outside of your organization with the people that make a difference in your company? Seeing and hearing the individuals featured on your podcasts will be more powerful than audio alone. A narrative-style podcast can often stand on its own without visuals, but if you want to demonstrate new products, teach new skills, or recap business results, video gives you the ability to both show and tell. Sharing those visual elements of a story is something a traditional audio-only podcast simply can’t do. Video podcasts simply aren’t as complicated or costly to produce as they once were. You no longer need a flashy studio equipped with expensive equipment and savvy video producers to make professional-quality video podcasts. 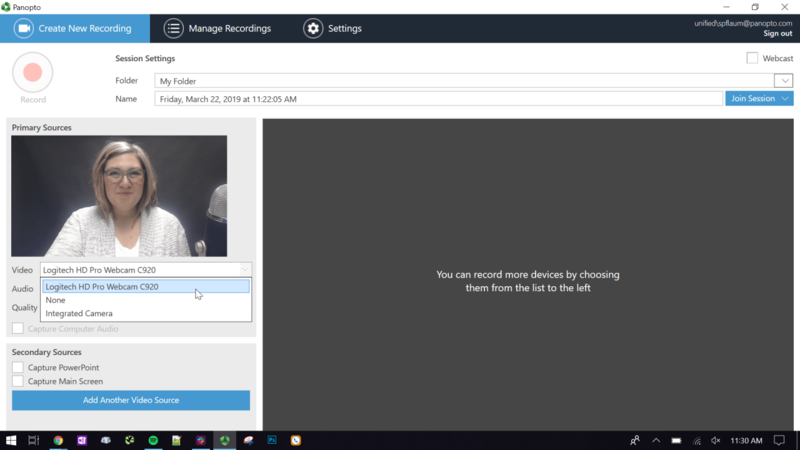 With just a laptop with a webcam and microphone or even your smartphone, you can record HD video podcasts as easily as you would an audio-only episode. With just a laptop, a mic, and a webcam, you can capture high-definition video podcasts that even includes slides or on-screen walk-throughs. For more complex setups, you can easily connect additional webcams, computer screens, mobile devices, more in order to capture multi-camera recordings. 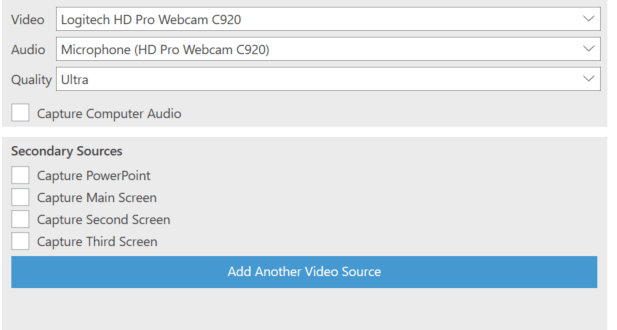 Panopto automatically detects the video and audio inputs connected to your computer, so you can simply click to select the audio and video sources you want to use. If you’re sharing slides, open your presentation and click the box next to “Capture PowerPoint” from the options under “Secondary Sources.” Panopto automatically ingests your PowerPoint slides, which also makes it easy for learners to search the content within your podcast videos later. If you also want to capture video of what you’re showing on your screen, or even multiple screens, you’ll simply click the boxes to record any screens you wish to present as shown below. Once you’ve selected the media for your podcast video, you’re ready to press “record” and start presenting. Pause your recording as needed and press stop when you’re done presenting. If you make a mistake, you can actually just keep recording. Take a deep breath to pause and begin again — you can edit out the sections of the video you don’t want after you’ve finished recording your video. Once you’ve finished recording, Panopto will automatically synchronize all the media feeds you’ve selected and upload it to the cloud for you to edit and share. Panopto’s HTML5-based online video editor makes quick work of basic video editing tasks. Trim unwanted sections from your training video, splice in new video to update outdated materials, and even switch between video inputs if you recorded video with multiple cameras. Video editing in Panopto is non-destructive, which means you can always revert back to the original recording if you don’t like something. Panopto automatically transcodes your video podcasts for optimized high-definition streaming on any device, so all you need to do to share your podcast after recording in Panopto is share or embed the link. You can even embed a video playlist so people can access every episode in order. While many podcasts are produced for a mix of internal and external audiences, are an increasing number of uses for video podcasting are strictly internal. If you want your video podcasts to only be available only to people inside your company, Panopto will keep your videos private — available to view only after an approved team member signs in. And if you aren’t worried about secure access, you can easily make your video podcasts public by adjusting the privacy settings — you can even upload them to YouTube for maximum exposure. Especially when it comes to internal training and communications, it’s often important for your team members to be able to quickly find and replay relevant moments from your messages. That’s why Panopto also indexes every word spoken and shown in your podcast, so everyone in your organization can search inside your archive of video podcasts. Best of all, with video search built in, employees don’t even need to be regular listeners to find value in your video podcasts. Even if an employee doesn’t even know about your video podcasting at all, thanks to automatic search indexing they’ll still be able to easily discover it within your video library and stream it on-demand. 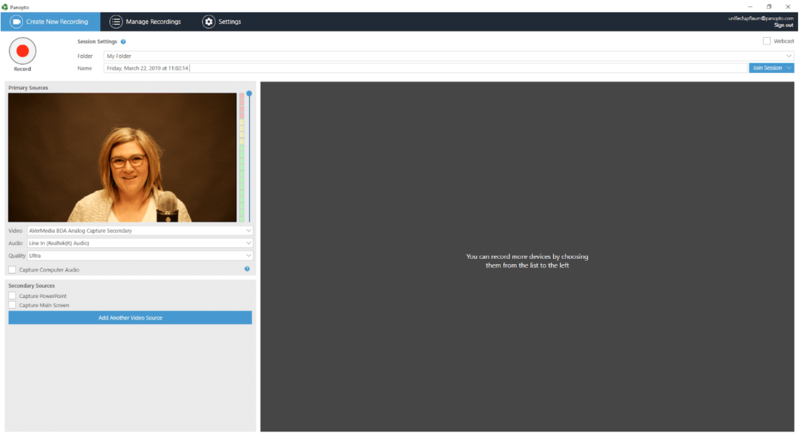 Panopto’s industry-leading video platform for businesses makes it easy to record, edit, and share video podcasts both inside and outside your company. If you’ve been thinking about enhancing communications with video contact our team to request a free 30-day trial of Panopo.